The design was made by randomly stamping a single stamp in black on both the front and back of a pre-scored card, with some images stamped off the edges. Tiny hearts were added in the spaces between the main images. The hearts and the centre of the main image were colored with a red pen. The sentiment was stamped in black on white card, trimmed to size and backed with red card. Red and white baker’s twine* was wrapped round the card, knotted and the end trimmed. An insert page was also added, which hides the twine inside and allows the receiver to concentrate on the written message. 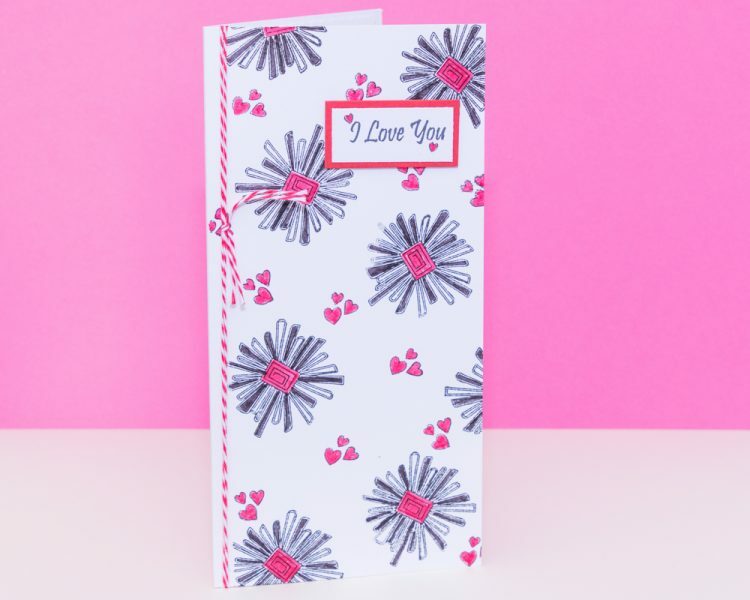 The card used here was a tall card, but the design works just as well on any size and shape of card. The design also suits any clear outline stamp, e.g. flower head with a tiny leaf in place of the hearts.